Although the drumbeat about content marketing began a few years back, it seems to have become rather loud over the last few months. We even see content marketing agencies and software pushing (pun intended) their products and services on a daily basis. Content marketing is not a particularly new phenomenon unless you consider the end of the 1890’s new. That’s right: as long ago as that companies were creating content they would distribute to consumers in order to give them information as opposed to selling them something. The theory is that compelling content creates a relationship – engagement – with the consumer and that at some appropriate point the recipient will turn to your company when they’re ready to buy. I’m a fan of content marketing. I think most people don’t like being sold to unless they’ve put their hands in the air and said “I’m ready to buy and I need information.” Those kind of marketing messages – TV and other ads – are push content. As Imus used to say “I talk, you listen” except what was being said by marketers was manufactured and shoved out the door. Content marketing is more “pull” marketing. It’s a newer model than the old push strategy. But is push dead? I don’t think so. Here is why. 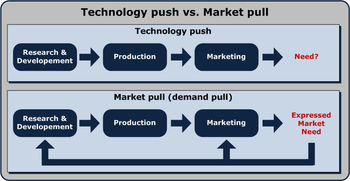 The basic definition of pull marketing means that you engage consumers or prospective/current customers. To do that you need to know something about them. If they’ve bought, you have that information and they know a bit about you through experiences that have left lasting, positive impressions. Hopefully you’ve dazzled them with world-class customer service (which I think is push marketing too). If they haven’t bought (yet), maybe you’ve been helpful to them in other ways. The implication is that, of course, is that you need to be discoverable. You can’t do inbound marketing if you’re invisible. If you’re trying to give potential customers the idea that they need to engage, they need to know that they have a problem for you to solve first. Maybe they haven’t done that – defined the problem – so how can they be considering a solution? That’s where push comes in. Sure, it may be intrusive and unfashionable and ridiculed as interruption marketing. But it has a role in the marketing mix. Even so, we have to keep a few thoughts in mind. We can’t spam people – drop unwanted messages on them over and over again. People have learned to tune those messages out. Even as we’re talking “at” them, we can try to anticipate their needs and wants even as we’re defining their problems for them. No, push isn’t dead, but it needs to be changed to match the ways in which consumer expectations have changed. Then again, if your marketing plan is still very much a function of last century, your revenues might be stuck there too. Make sense? I saw something last evening that provides the inspiration for our Foodie Friday Fun this week. If you’ve been reading the screed for any length of time you know that I’m a fan of Hell’s Kitchen. The contestants are professional cooks (I hesitate to say “chef” since very few of them seem to have the qualities needed to be a team leader in the kitchen). I believe all of them have been to culinary school but all do work in professional kitchens. One would think that a work environment that’s filled with opportunities to do damage to one’s self would prompt a pro to make safety an intrinsic part of how they work. As last night showed, not so much, which also prompted a business thought. 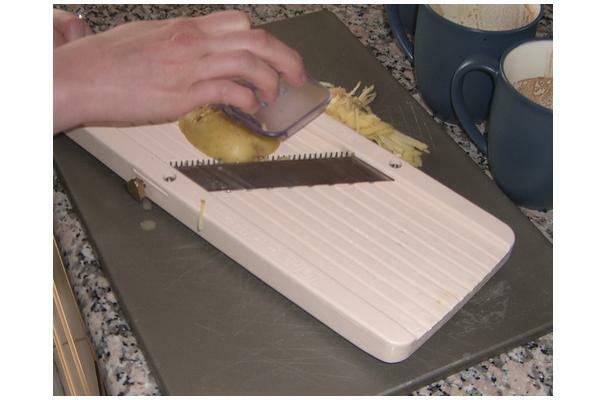 One of the cooks was using a mandoline to slice a potato. As you can tell from the photo, a mandoline is a fabulous way to cut off the tip of a finger or two if you’re dumb enough to hold whatever is being sliced in your hand instead of using the guard/holder. In a pinch you can hold the veggie against the blade with the palm of your hand pushing it down, but you never expose your finger tips to the blade just as you don’t dice with your fingers straight out. Needless to say, the professional cook took a trip to urgent care to replace the piece of his finger. Here is the business thought. The cook has probably used this tool hundreds of times in just this way and without harm. Most professionals do things over and over and at some point those things become second nature. Unfortunately, that routine may incorporate bad habits. Amateur cooks like me have to think carefully when we use dangerous tools. I’ll admit I think less when using a chef’s knife than when I use a mandoline, but I do pay attention in both cases since I don’t use either tool for hours at a time every day. The same holds true with our business activities. Reports become routine. We do fill-in-the-blank analyses. That’s when someone – the business! – gets badly hurt. Business professionals need to learn from amateurs, or at least learn to approach the tasks they do daily with the same care as the person who rarely does those tasks. Think to when you were given an assignment which involved something new. You double and triple checked everything and were super careful. That’s the amateur mindset. And now it’s off to pull out my mandoline to remind me to be careful today. Care to join me? A few things crossed my desk here at the world headquarters and they prompted today’s screed. There really isn’t much new in the data I’m about to share but when you put these things together it raises a question. Late Millennials (18-24 years of age) now spend more of their daily ‘TV time’ watching online sources than live broadcast/cable sources (33% versus 29% respectively). This is unique to the Late Millennial segment, as even Early Millennials (25-34s) spend significantly more daily ‘TV time’ viewing live broadcast/cable than online sources (30% and 23% respectively). Announced today, the U.S. multichannel segment posted its first full-year decline in subscriptions, according to SNL Kagan estimates for cable, DBS and telco offerings at the end of 2013. While seasonally driven quarterly declines have become routine for industry watchers, the annual dip illustrates longer-term downward pressure even as economic conditions gradually improve. According to the tally for the trio of platforms, service providers collectively shed 251,000 in 2013, dipping to approximately 100 million combined subs. The industry added 40,000 video subscriptions in the fourth quarter, slightly weaker on a year-over-year basis and not enough to offset the broader downward momentum. What they also found was that 30% of simultaneous use is looking at related content (what they term meshing) and 70% of simultaneous use is looking at unrelated content (stacking). TV is background noise. So here is the thought. I don’t think there is a “second screen”. While younger people’s brains are wired a little differently with respect to multitasking, they seem to have decided that they’re going to program their own channels, access them through a different pipe, and then micro-program within the programs themselves by paying selective attention to the menu of choices they’ve created. I realize there’s not much new in that but the pace at which it seems to be happening is new and will only accelerate as better broadband is available. New Data Confirms Pay TV’s Slow Decline. Will Cord-Cutting Trickle Become Become Gusher? One of the challenges any of us have in business is to predict the future. The hardest part of my job – and maybe yours – is seeing over the horizon to help my clients get prepared for what is to come. That might be a change in a market or it might be a change in technology. No matter what it is, any of us who look ahead do so by gathering data. In many cases that data is some measure of past behavior – how people bought from your website for example. In many cases, those data points are put into some sort of algorithm which predicts what is to come. Increasingly, many marketers and others use these models to drive their own business behaviors as the amount of data available grows exponentially. While I’m not a believer that “big data means big problems,” a blind reliance on these algorithmic predictions can mean just that. Let’s take one simple form of algorithm. You probably see it every day. it’s known as collaborative filtering and if you’re on Amazon or Netflix or any other site with a recommendation engine you’ve used it. You may also have seen things offered to you as content on YouTube. The algorithms use measures of your past behavior as well as of others like you (“people who bought XYZ also bought…”). But what if you were buying a gift and the purchasing is not reflective or your tastes or interests at all? What if someone else used your browser to search and purchase? Cookies are browser-based – they have no way to tell if the activity is from one person or six. Another problem. Algorithms are built by people and those people are..well…human. They might have confirmational bias operating as they refine the formula to eliminate noise – data that’s not germane to the prediction at hand. The problem is that you don’t really know if it’s noise until it proves to be not significant. Maybe it’s a new trend that your model misses altogether. The thing to keep in mind is that modeling can only go so far. It’s not very good at predicting the unexpected. It tends to ignore outliers. As with all things, you need to ask questions, search for facts, and draw your own conclusions. Yes, it’s impossible to make sense of all this data without algorithmically based analysis. Just remember that while machines don’t make computational errors it was a human that gathered the data (or installed the code that does) and wrote the formula. People often don’t compute. Make sense? I had a hard time about this week’s TunesDay selection. Hard not bop along to the Motown house band (The Funk Brothers!) although I’m not sure running through the auto plant’s paint department without a respirator is great for one’s voice. In any event, why did this choice give me trouble? Maybe because it inspired so many business thoughts. Let me share a couple. made me think of technology. Every day there is a new story about someone invading consumers’ privacy. None of us seem to have enough time in the day to focus on anything because we’re all too focused on everything. In the tech world (and elsewhere) we’ve gone from taking the time to make sure what we produce is great to trying to crank out something – anything – that’s good enough. After all, the product will be obsolete in a few months anyway. Yet there is nowhere to hide – we depend on these devices and it’s hard to stay private when you’re using publicly accessible tools. I also had a thought about customers becoming addicted to products. Putting aside the obvious issues with a physical addiction to drugs or alcohol, I think some brands like the notion of having customers feel “you’ve become a part of me.” True enough – fostering a conversation is where marketing needs to be but despite the upbeat music, this song is quite dark. Do we want our customers feeling there’s no place to hide, whether it’s from our ads or our prying eyes? I think not – what do you think? Let’s begin the week with another entry in the book of social media marketing stupidity. One trend of which you might be aware is real-time content marketing – brands responding to events as they happen. It’s rapid response content creation and the best-known example is Oreo tweeting out a clever marketing message in response to the blackout at last year’s Super Bowl. This wasn’t the result of a smart intern winging it. There were ad agency and brand people at Oreo’s social media command center during the game. 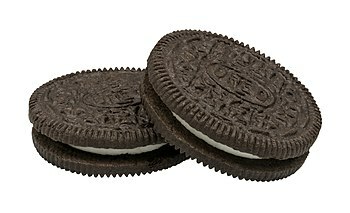 The success Oreo had inspired many copy cats. In fact, a study done around that time found that over half the brand folks surveyed thought they’d be making greater use of real-time data in their marketing. Fair enough. Now let’s see what Oreo has wrought. Yesterday during the NCAA Men’s Basketball Tournament, CBS showed a shot of a young Kansas fan who was crying as his team lost. Some marketing genius at KFC thought it would be clever to tweet out a screengrab of the teary child along with a marketing message to the 500,000 people following their Twitter account. After all, what better way to sell fried chicken then on the back of an upset kid! It was such a good idea that KFC pulled the tweet down shortly thereafter as someone woke up and realized that finding a sales message in a crying kid’s unhappiness is way over the offensive line. Credit them for moving fast to pull it down (although it would have been nice if they’d have issued an apology as well). Contrast this with something I saw this morning in an online golf publication I read. The former head of the USGA passed away yesterday – the announcement came late in the day. Less than 12 hours later, the USGA has a tasteful ad in the publication saluting the man. Real-time? Not exactly but certainly quickly after the event. Different from social media? Yes, although they certainly could have used this in all of their social channels and they did, in fact, do other things in those channels. Real time doesn’t mean “speak before you think.” It means coming across as authentic and relevant (and really funny never hurts either). That’s not as easy as giving a kid the keys to your social account and a TV to watch what’s going on. It may not take a lot of planning to be good in real-time – that would kind of negate the purpose. It does take managing, however, which is clearly what someone did after the KFC tweet went out. Do you see the difference? Foodie Friday, and today the topic is caul fat. “Never heard of it” you say? Caul fat is one of those ingredients that is rarely used by the home cook and sort of falls into the “secret ingredient” category along with duck fat. 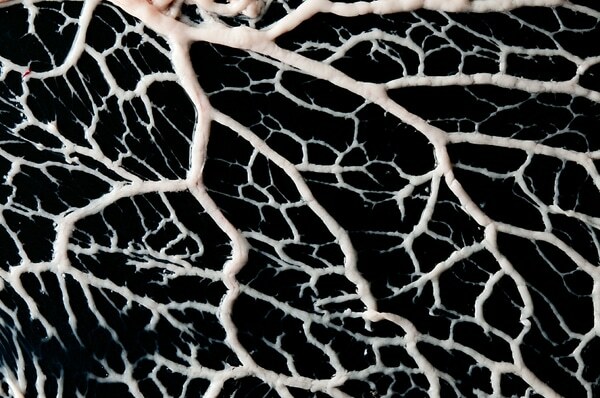 It’s the web of fatty membrane that encases the internal organs of various animals. Pork caul fat is the one most cooks prefer but cooks use that of cows and sheep as well. The cook wraps whatever he’s cooking in the fat before cooking it and it adds moisture and flavor. Most of the time, you see caul fat being used as natural sausage casings in crepinettes (fegatelli for my Italian friends) or to wrap items that lack a great deal of their own fat such as game birds. It’s also used as an outer shell of sorts for patés when they’re being cooked. What does this have to do with business? I think good managers are like caul fat. They bring things to the business that aren’t always readily apparent unless you dig down into the recipe. It may be how they set the tone for the business. It may be how they hold the team together, much as caul fat holds the sausage patties that are crepinettes together. Caul fat is one of those ingredients for which you have to search. You probably won’t find it in your supermarket. Great managers are the same way, and like caul fat, when you first come across a great manager you might be surprised by it. Secret ingredients are what make any dish really memorable. After all, if every restaurant cooked the same dish the same way, why would we try new places? Those ingredients are things that help a dish, a restaurant, or your business stand out in a crowd. Caul fat’s why one cook’s roasted chicken breast is moist and flavorful and another’s, who cooked it the same time at the same temp with most of the same seasonings turned out a dry, flavorless product. Great managers are a secret ingredient which, like caul fat, make a huge difference in the finished product even if it’s not clear who that fabulous final product came to be. They make the difference between a good business and a great business. That’s my take – what’s yours?